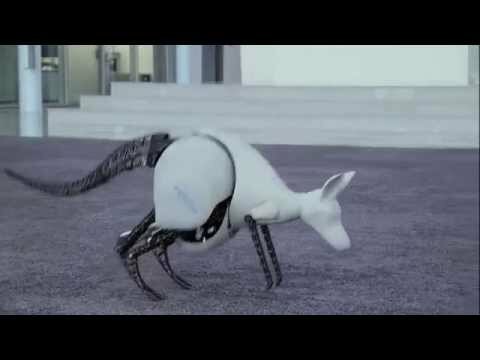 The robot, officially called BionicKangaroo, is interesting because it pushes the boundaries of what most people think of when it comes to transportation. While most vehicles move on rolling wheels, the BionicKangaroo is able to make stabilized jumps from place to place via an operator that uses gesture-based remote controls. Festo, the firm that spent the last two years building the robot, said the BionicKangaroo also mimics the animal’s natural ability of storing energy between jumps. Real kangaroos have advanced Achilles tendons in their legs that store energy when hitting the ground from a previous jump, which is released upon making the following jump. It’s actually a pretty energy-efficient process that Festo wanted to recreate in mechanical form. In addition to being a project even Sonic the Hedgehog nemesis Dr. Robotnik would be impressed by, it’s probably the coolest thing you’ll see all day. That said, we’ve taken the liberty of embedding a video of the BionicKangaroo in action below.